The ruins of Kirkstall are now situated on the outskirts of Leeds, some three miles from the city centre. The site is bisected by the A65 Kirkstall Road, but in the late eighteenth and early nineteenth centuries the main thoroughfare to Leeds actually ran through the nave of the church. The landscape surrounding the abbey has undergone considerable change since the time of monastic occupation, when Kirkstall was a secluded spot in a rural setting, bordered by water and woodland. 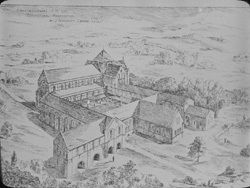 In fact, until the mid-eighteenth century when rapid urbanisation began to engulf the ruins, the abbey was surrounded by countryside. The availability of water and woodland made the site at Kirkstall well suited to the establishment of monastic life. Water, that was necessary for drainage, washing, cooking, the powering of machinery and liturgical purposes, was channelled from springs and streams above the abbey and from the millpond that stood where the carpark and sports pitches are now. The River Aire bounded the abbey to the south and was an important means of transport. Stone building blocks that were quarried nearby could be transported to the abbey along the river; excavations in the 1950s recovered the wooden jetty where the stone was landed. Hawksworth Wood, which is now virtually consumed by a housing estate, stood to the west of the abbey. It provided shelter, fuel, pannage and building resources such as thatch; timber was generally brought from elsewhere since Alexander, the founding abbot of Kirkstall who completed the initial building work, was concerned to preserve the woodland at Hawksworth. Since the dissolution of the abbey in 1539, the site and ruins have attracted artists, poets and even ghosts. In the nineteenth century the local newspaper reported that ghostly apparitions had been observed in the nave of the church; one witness claimed to have seen a funeral procession of sombre men, clad in white, proceeding slowly down the nave. More recently, staff and visitors have alleged to have seen the figure of a former abbot of Kirkstall walking around the old gatehouse, which is now the abbey museum.